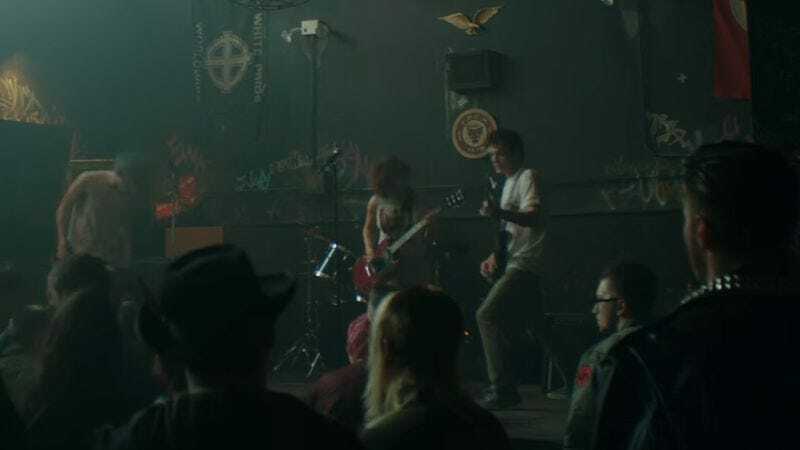 Jeremy Saulnier’s Green Room, a well-reviewed survival/horror film that pits a punk-rock band against a group of violent racists, is entirely fictional. Patrick Stewart is not a white supremacist in reality, and the movie’s heroes, The Ain’t Rights, are not a real band. But Saulnier didn’t want them to look blatantly fake, the way ersatz bands usually do in movies. So he brought in a professional: singer-guitarist Hutch Harris of The Thermals. In an article for The Talkhouse, Harris talks about the strange but rewarding time he spent working on the movie, trying to make the fictional band seem as nonfictional as he could. Movies rarely get rock bands right, Harris says. He points out how odd it is that actors will gladly gain or lose weight for a role, yet learning a few simple chords seems beyond their grasp. “When I see an actor strum one sad, poorly fingered G chord for an entire song on screen,” Harris writes, “I’m not so much disappointed as I am surprised.” Luckily, Saulnier was willing to spend time and money to make The Ain’t Rights authentic. Throughout the process, Harris’ gold standard for accuracy in rock movies was Rob Reiner’s 1984 mockumentary This Is Spinal Tap. “The titular band in This is Spinal Tap actually played their instruments and the songs in the film—they were a real band playing real songs,” he says. And that movie was accurate about music business politics, too. The members of Spinal Tap would know that a bunch of no-name, last-minute fill-ins like The Ain’t Rights would never have had access to the green room in the first place.